As we welcome spring, we’ll need to make room for another observance: the first-ever National Healthy Fats Day on March 21, a celebration of the traditional healthy animal fats – pure lard, beef tallow, duck fat, goose fat and the like – that are now enjoying a resurgence within America’s food culture, in restaurants, fast food operations and home kitchens. Artificial trans fats are out, and minimally processed animal fats — for superior baking, frying and a host of other cooking applications – are making a comeback. The color, texture and flavor that healthy animal fats impart make them a vastly superior alternative to heavily processed, industrially produced substitutes. 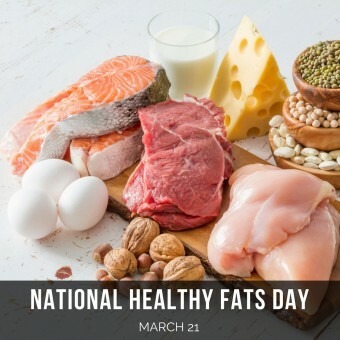 National Healthy Fats Day, established as an annual event, is the brainchild of The Healthy Fats Coalition, a new educational initiative comprised of those who understand that healthy fats are an essential part of the American diet. Coast Packing is proud to be a founding member of the HFC. The HFC’s mission: to create an enlightened conversation about the food we eat, though news and editorial commentary, social media conversations, opinion surveys and more. For more information on the Coalition, please email info@healthyfatscoalition.org. National Healthy Fats Day is just the beginning. The Coalition is also promoting National Beef Tallow Day, set for July 13 (and coinciding with National French Fry Day), and National Lard Day, December 8, a day ahead of National Pastry Day, Dec. 9. The HFC’s message for each day: mark the occasion by tasting the difference yourself.